Official figures put the capercaillie population in Scotland at just 1,114 birds but people power and funding from The National Lottery is set to change all that over the next five years. The Heritage Lottery Fund has committed £346,500 for the 18 month development phase of the Cairngorms Capercaillie Project with a further £2.25million possible for the delivery phase. The funding package overall – should the delivery phase get the go ahead – equates to an investment of around £4million in the Park economy with finance also coming from the lead partner – the Cairngorms National Park Authority (CNPA) – along with Scottish Natural Heritage (SNH), RSPB Scotland, Forestry Commission Scotland (FCS) and Forest Enterprise Scotland (FES), Cairngorms LEADER, the Game & Wildlife Conservation Trust (GWCT) and The Highland Council through the Scottish Landfill Communities Fund. The Cairngorms Capercaillie Project is being hailed as an innovative and ambitious project which has the potential to save the species for future generations. The Cairngorms National Park has the last viable populations of the bird with the Badenoch & Strathspey area being particularly significant. With that in mind, the village of Carr-Bridge has been chosen as a pilot community where they will have a major say on key elements of the project, helping to work up practical ideas that can be tried and tested with successful initiatives being replicated throughout the National Park in the future. The five year project will be focusing on two main areas; providing suitable, improved habitat for capercaillie and involving the public in the future survival of the species. 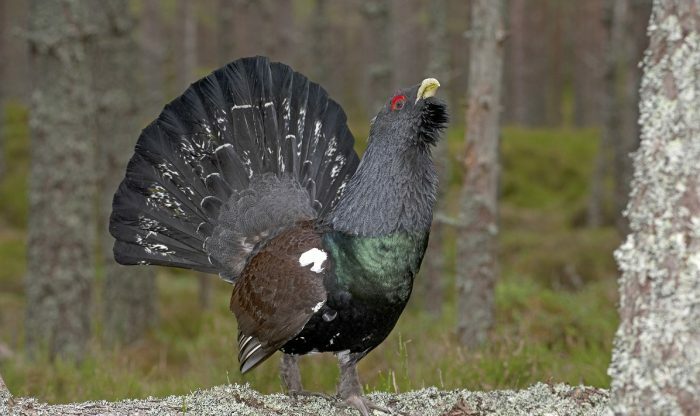 Healthy habitats are extremely important with enhanced pine forests and better connectivity, but what will be key to the project’s success is how capercaillie and people can live together. New jobs will include a Project Manager to co-ordinate and manage the project and a Capercaillie Community Ranger to develop community involvement. Part-time project posts will include a Communications and Interpretation Officer and a Capercaillie Advisory Officer and Assistant to deliver advice and support to landowners. Previous to this announcement the amount of funding from the Heritage Lottery Fund invested in the Cairngorms National Park in the last three years was almost £6million for the Tomintoul & Glenlivet Landscape Partnership, The Mountains & The People Project and The Badenoch Great Place Scheme, with total project spend being almost £10million. All being well with the delivery phase of the Cairngorms Capercaillie Project there will be another £4million working hard to deliver benefits for people and conservation.